Do you like to draw, paint or sculpt people or animals or just love taking selfies? 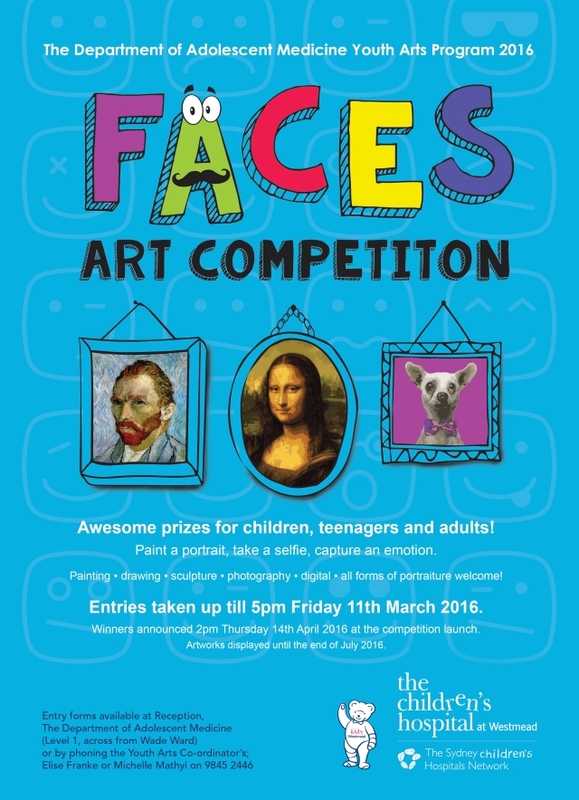 Well, The Youth Arts Program at The Children’s Hospital at Westmead are looking for people to enter their Faces Art Competition. This year the theme is FACES, they are looking for entries of portraits in a variety of mediums (painting, drawing, photography, digital media, etc.) of significant people or animals in your lives. Entry is free and open to all ages. Entries will be taken up until the 11th March and then a display of the artworks will be opened on 14th April as part of our Youth Week celebration. Please contact the Youth Arts Coordinators - Elise Frank or Michelle Mathi - at the Department of Adolescent Medicine on +61 2 9845 2446 for hard copies of the entry form or click here to download.